By the Australian National Bureau of Statistics’ measure, life expectancy at birth for Australians is 78.5 years for men, and 82.4 years for women (figures for 2005-2007). These aren’t precisely the same as the World Bank’s figures for the same period (which are slightly higher) – but they’re pretty close. (The World Bank figures for 2006, which I’m assuming is the best comparison year for this data, are 78.7 for men, 83.5 for women, and 81 overall). 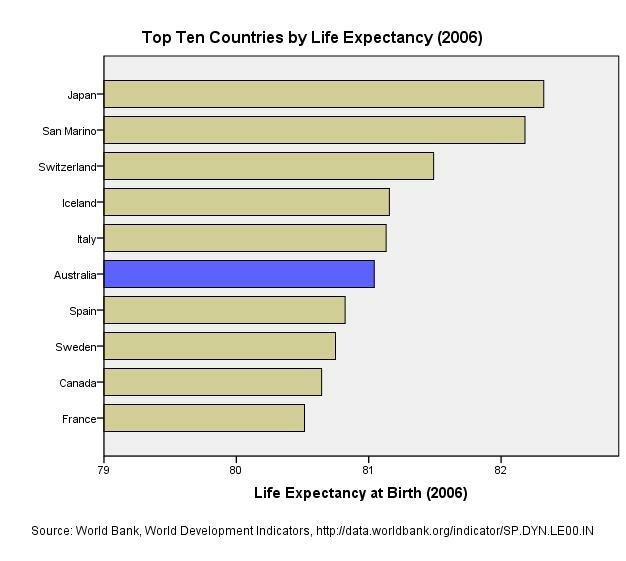 These figures are outstanding: they put Australia above the average life expectancy for high income countries. (Which is: for men 76.2, for women 81.9, overall 79) Australia is in the top ten countries in the world for life expectancy. But these numbers don’t capture demographic differentials within Australia. 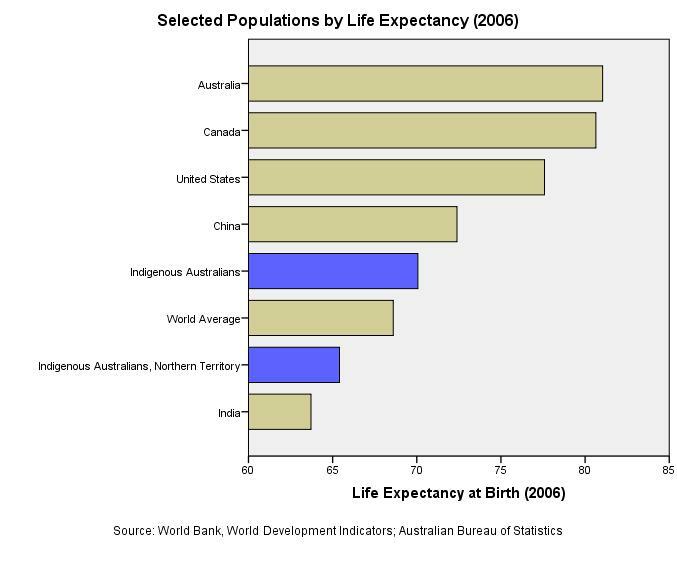 Notably, Indigenous Australians have markedly lower life expectancies than those for the country overall. If Indigenous Australians were their own country, the life expectancy of that country would fall between those of Guatemala and Morocco. Now looking just at the Indigenous Australian population of the Northern Territory, life expectancy for men is 61.5; for women 69.2. Again weighted by male and female population, I get an average life expectancy for this population overall of 65.41. That figure is less than the average life expectancy for the world. If the Northern Territory’s Indigenous Australian population were its own country, that country would have a life expectancy just higher than Bhutan, and a bit lower than the Solomon Islands. This doesn’t seem to be a defensible state of affairs.